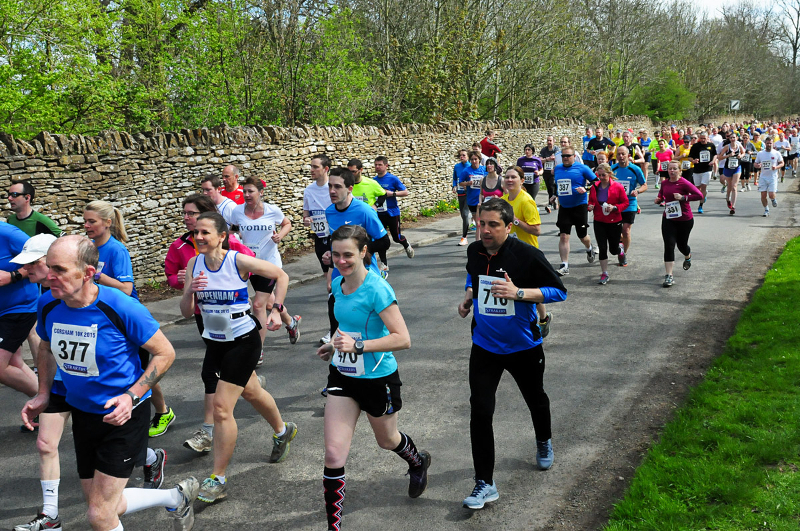 I love the Great Chalfield 10K. Beautiful course with enough undulations to be challenging but not so many that you can’t appreciate your surroundings. Low key organisation, but with accurate timing. Race HQ is the small scout hut on the Common in Broughton Gifford and profits from the race go to the Scouts. Always a medal, weather that varies from torrential rain through to scorching sun. Perfect! Sometimes a race is run for a PB. Sometimes as a new challenge. Sometimes it feels like you’re taking several steps backward, and just hoping the forward steps will come in time. Last night was one of those, and bearing in mind my lack of recent running I was thinking of this 10K less as a race and more as a little trot with a number pinned to my front. I had promised myself a little walk up this hill, but actually because I’d been sensible and taken it easy from the start I felt okay and carried on running. I had an interesting chat with a man who’d dragged his son along for his first run. The son was swearing away at his Dad, but made it to the end just behind me. Kudos to him! I was also delighted with my medal. Apparently you’re supposed to get fed up of “participation” medals after so many years of running, but this one felt like a real achievement and that I’d really earned it. 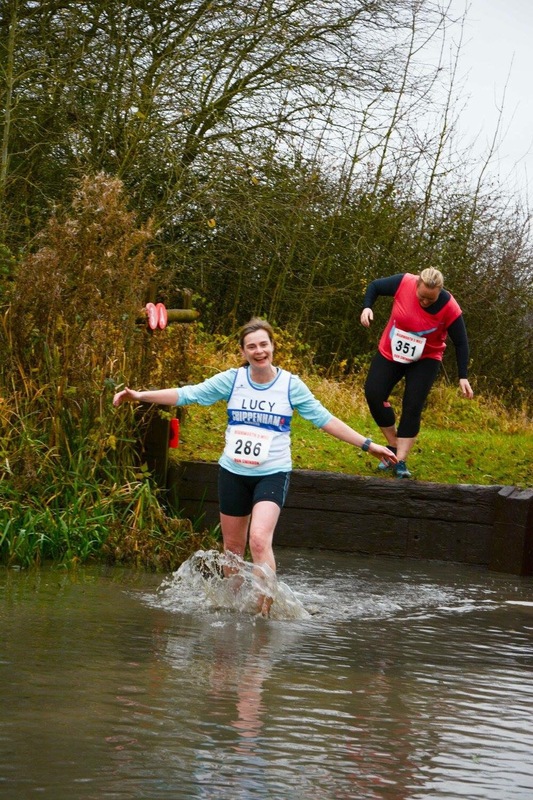 Looking back, I see I ran this race in 2012 (hot and muggy); in 2013 (really really wet but an amazing PB); in 2014 (the disappointing one with the stitch) , AND in 2015 (first one in a Harriers shirt, just not MY Harriers shirt). Rather sad I missed last year now! I’m a Wiltshire Off Road League Champion! So I managed it. 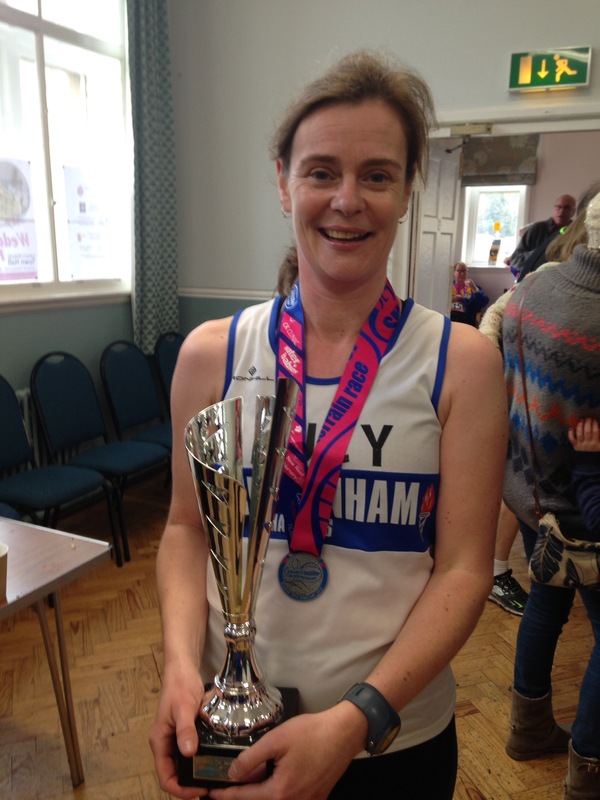 I’m the 2016 – 2017 Ladies V40 Age Group winner of the Wiltshire Off Road League. Phew! The prize will be presented in June, so I’ve a while yet to clear a space on the mantlepiece. To celebrate, thanks to a friend’s suggestion I’ve pulled together a collection of my “most attractive race faces pulled whilst winning this category”. Enjoy! Starting in brilliant sunshine was the Marshfield Mudlark. Hiding at the back in this team photo, confusingly I’m not the one with “Lucy” on her vest. Next up was the White Horse Gallop. We got up close and personal with the Westbury White Horse, and I got possibly my most favourite race photo ever. Keeping to the horsey theme, the Wickstead Wander involved horse jumps, ditches, a large amount of water, a rosette and an inflatable dolphin. 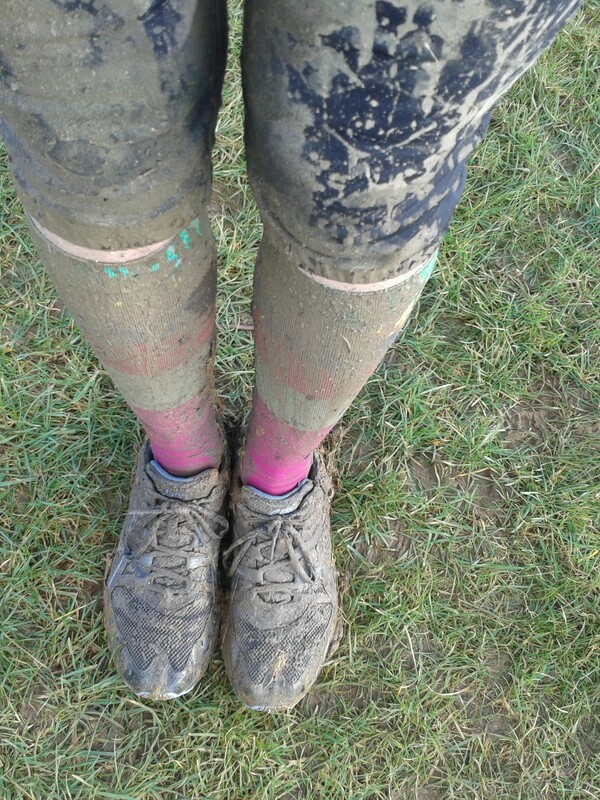 The tri-county XC race at Bath University was a scary, serious race. Not only was I last Harrier home, I was the last person home in my race. No race face, but a great warm-up skipping photo. Next up was the big one, the Lungbuster, which unexpectedly had “the hill” twice. After the Smasher, they handed out the team prizes, and I got to stand in for our Men’s team captain who was ill and collect the trophy with Julia, our Ladies’ captain. I wasn’t letting go of the trophy once I got my hands on it! That was quite a season, more so because I accidentally entered the League as an easy way back into racing. I’ve always preferred off-road running, as it’s much easier than all that tarmac and no one minds if you walk up the hills*. There’s mud to mess around in, water to jump into and more often than not cake at the end. Have I sold it to you yet? 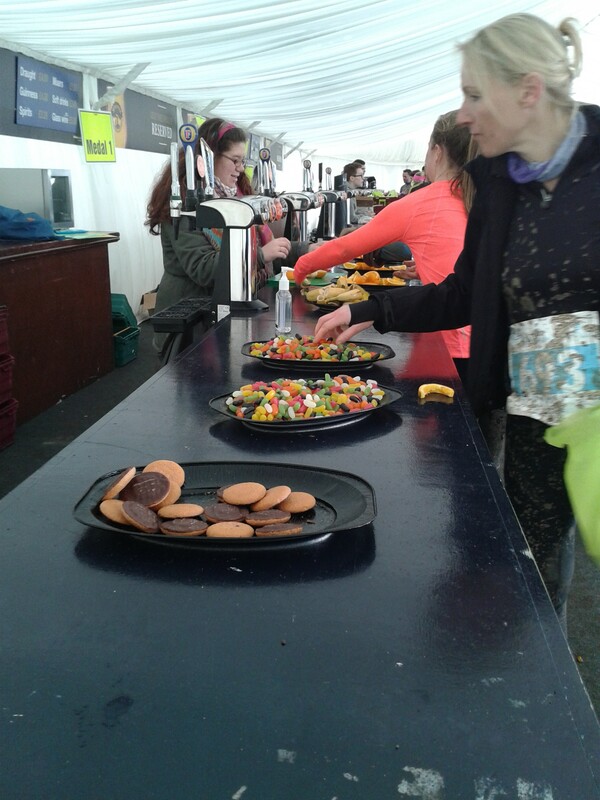 You also get the usual assortment of goodies at the end. *Except in the XC race. No one walked the hill. I think it meant instant disqualification. Or something like that. Posted on 23/02/2017 20/03/2017 Categories 10K, Off RoadTags age category winner, Wiltshire Off-Road LeagueLeave a comment on I’m a Wiltshire Off Road League Champion! Anyone who has had to sit with me through our respective children’s school sports day knows the story about me and the skipping rope. It’s a sad tale going back I guess 41 years, so sit down, make yourself comfortable and I’ll begin. Unless I’ve already unburdened this story onto you, in which case feel free to skip to the bit where I try and link it to my current situation. At school, I wasn’t one of the sporty ones. I was more of a nerdy, glasses-wearing bookworm. One year in primary school I was given the chance to represent my ‘house’ in the Obstacle Race. This was it! My big chance! I frantically grasped the opportunity with both hands (much in the way I had to use both hands to catch anything). I practised throwing strangely smelling square canvas beanbags into plastic hoops. I was small and skinny, so wriggling through said hoops was fine. I skipped as though my life depended upon not catching a foot in the rope and tripping up. My preparation was impeccable. Come the day, I was primed and ready. 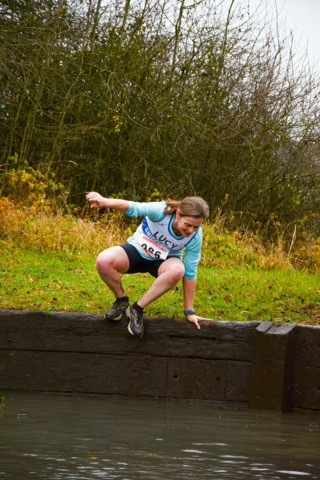 As ready as a NHS-glasses wearing klutz standing on a start line can be. The whistle blew, and I threw those beanbags. I shimmied through the hoops. I ran towards the waiting skipping rope and realised that, amazingly, I was in the lead! I simply had to untie the skipping rope, and skip to the finish line, just as I’d practised for the last few days. I excitedly picked up the skipping rope to untie the knot, and unti-…. and unti… and nnnnnnnnghf! and realised the rope was tied too tight and I simply couldn’t untie it. As I stood in my lane struggling, everyone else caught me up, easily untied their rope, and skipped off into the sunset. I came last. Have I had a complex about this incident? Deep emotional trauma? * Well as I said, I’ve retold it many times and I can still feel the mix of fury and frustration that I felt on that day. So, why the need to unburden myself now? It struck me that I am currently in the same position as I was on that day standing on the start line. As I have mentioned once or twice I am on course to win my age group in the Wiltshire Off-Road League – I just need to complete the final race, which is on Sunday. If I don’t finish (or don’t start) then my friend will win instead. Obviously I’d far rather my friend won it than someone from another running club but equally I’d rather I won it than her (I knew I had a competitive side deep down), if only because I’ve never won anything like this before. I’m also unlikely to ever be so close to winning it again. It’s so close I feel a little bit sick. So on Sunday morning, if I make it to the start line, think of me and make sure my skipping rope is loosely tied, and my shoelaces are tightly knotted. *Yes I do, as with so much to do with PE in school. Have I told you about the hockey lesson? Well maybe that’s for another day. Two weeks, two races. 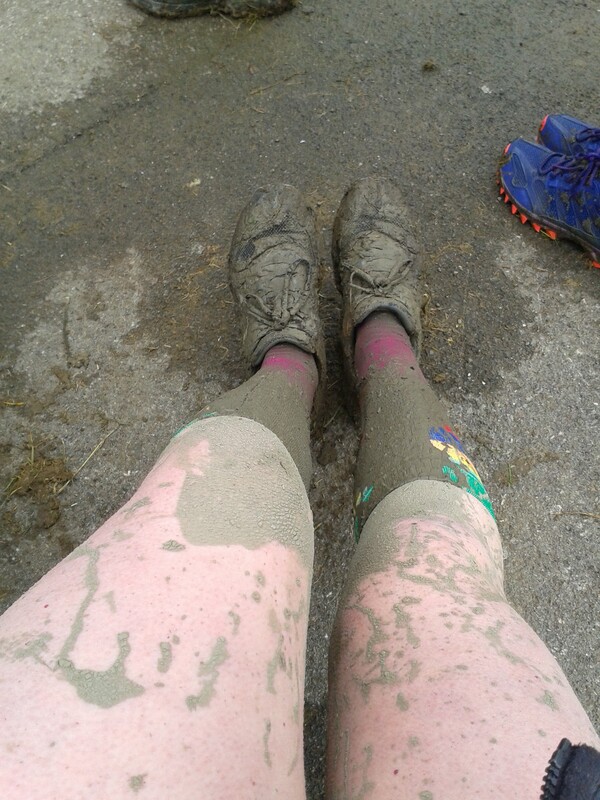 A muddy, hilly trail race and a fast, flat 10K. Both pretty chilly, both hard work but both an achievement in their very different ways. Last week was the Wickstead Wander. A 5 mile meander over hills, down paths, through farm yards and over horse jumps. And through water jumps. It was good fun, despite being able to see runners in front of you then learning there’s actually an extra sneaky loop you can’t see between you. I loved the marshals who helped runners leap over a stream, and the biggest water jump had marshals armed with cameras and a safety inflatable dolphin. In my defence, I couldn’t see how deep the water was so tried to lower myself elegantly into the black, smelly water. After being injured and not running ‘properly’ for so long I felt like a beginner in my first race. I didn’t know what pace to run, or what time to hope for, but I vaguely knew I’d be very happy to get anywhere near an hour, as I remember how hard I worked first time around to do that. 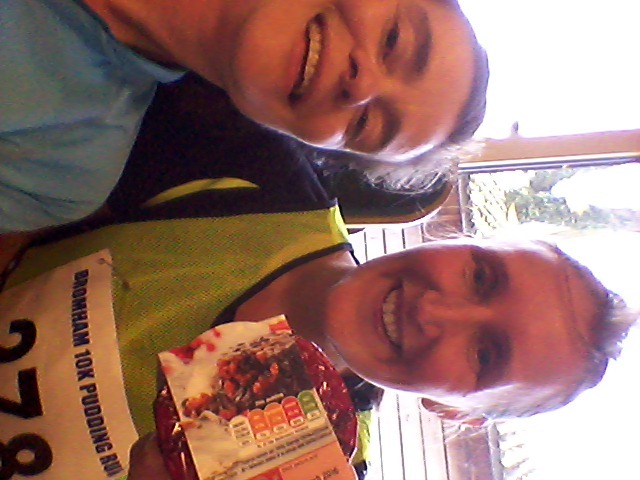 I ran with a friend from my running club, who was aiming for just under an hour to beat her PB. 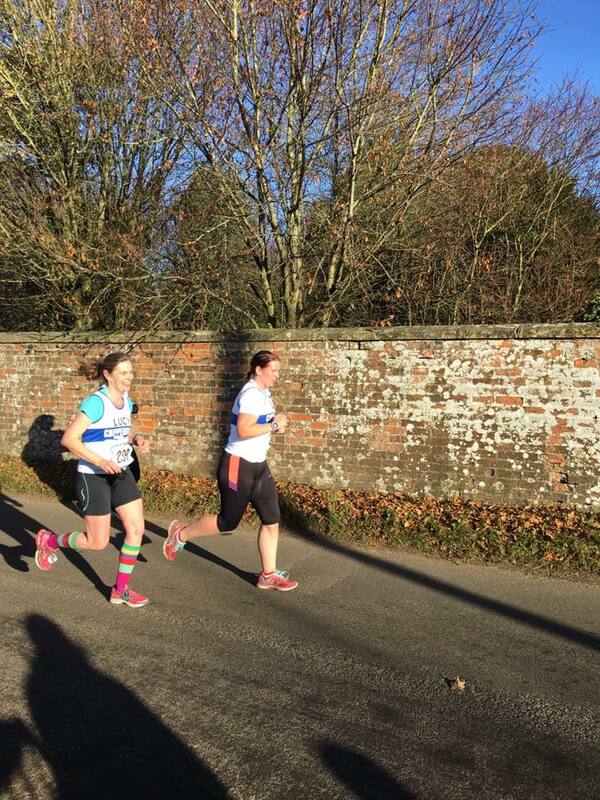 We worked hard together, enjoyed the sunshine despite the frost and although I left her in the last mile (she told me to go!) we finished within 30 seconds or so of each other. The photo shows me crossing the finish line feeling shattered but happy. I collected my official time, and was split between being pleased with getting so close to an hour and being annoyed at how close to the hour it was. 6.2 miles in 1:00:03.9 – I’ll take that! I’d forgotten just how hard ‘proper’ races are (ones that don’t involve mud, water or hills) but I’m very glad I did this one as it’s boosted my confidence no end. 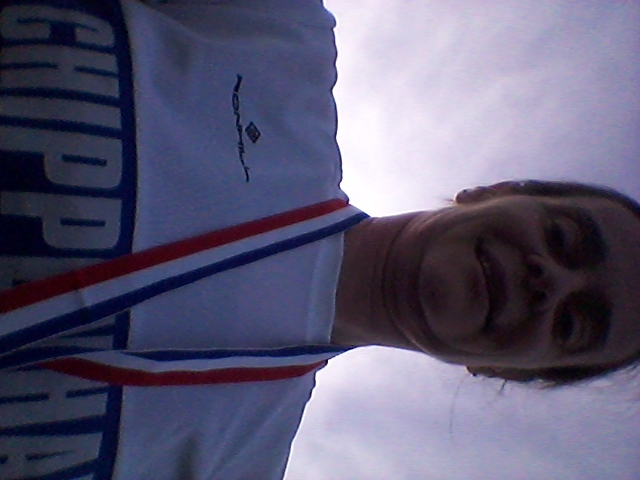 Tonight it was the Great Chalfield 10K. It was very hot, my legs were still tired from Tuesday’s race, and I was still haunted by the awful stitch I had last year on this race. However it was beautifully sunny, the race route is beautiful (if a little lumpy), I was smothered in suncream and was wearing my attractive running cap. Race time! As I arrived at the scout hut in Broughton Gifford, I could see small groups of Harriers shirts. Yet again, I recognised just a few of them – this is such a big running club I keep coming across completely different people! However they made me feel very welcome, and it was good to stand and chat in the sunshine. This race is such a lovely low key event, that I’ve run it for the last few years. I love how you park your car right next to the start / finish area. 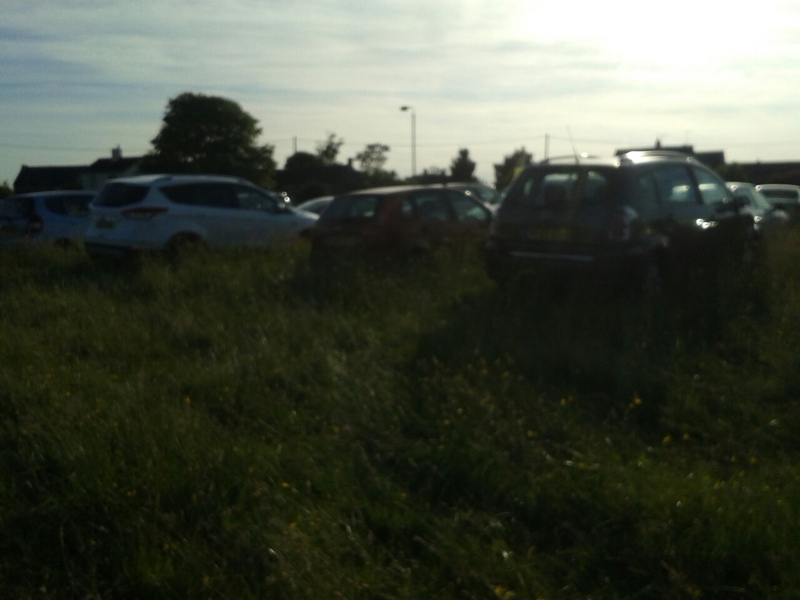 This year, the common hadn’t been cut, so it was a bit of an adventure getting the car onto the common, and wading through the grass to pick up my number. As 10K races go, it was hot, it was fast, I felt like I was pushing as hard as I could but Tuesday’s Lacock Relay was still in my legs so i didn’t worry about the time but figured I’d take it a little easier in the first half and see how it went. In the second half I was still feelingokay so I pushed a bit harder. Past the Great Chalfield Manor, past the scary barking dog, up the long long hill at 8K and sudenly I was passing a few runners. This felt good! As the long straight road led to the finish I could see groups of Harriers shirts again, and here “Come on Chippenham!” and also “Come on Lucy!” being shouted. It felt good, so I pushed for my sprint finish. On getting home and uploading the data, my time was 57:28 which is definitely not a PB. However, my final 0.2 mile sprint finish, according to Strava, was the fastest I’ve run it at 6:58 minutes per mile. This is fantastic, although I don’t know if I believe it! Roll on those stiff legs tomorrow! * Actually I still haven’t got my own shirt – this is still a borrowed shirt from another, very lovely Lucy. Thank you Lucy! 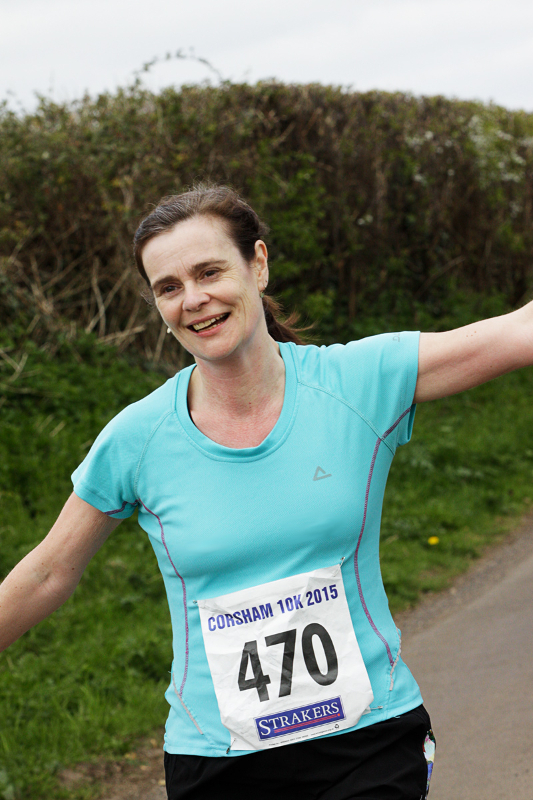 What can I say about the Corsham St George’s 10K race? The simple fact that the numbers running it are increasing year on year says everything. It was my third time running it and I was looking forward to it. 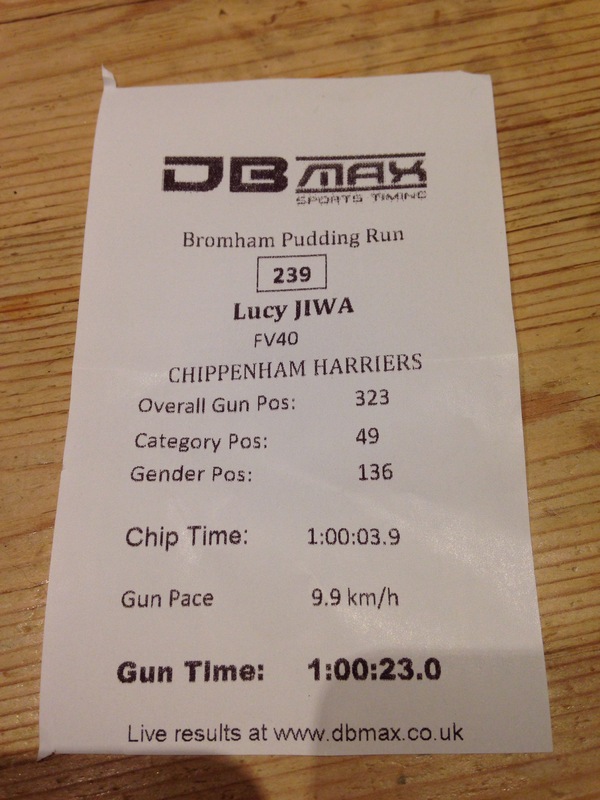 As well as running a good race, my aim was to meet up with another Lucy. This lady is a-friend-of-a-friend who had kindly offered to change her routine and come to my first Harriers session with me. I was brave, went on my own and didn’t take her up on her offer. However I still wanted to meet up as apparently we run at very similar paces, are similarly keen on our running, and I gather she’s a lovely person. I looked all over for her at the start but couldn’t see her anywhere. I had seen a blurry photo of her on Facebook, and I knew her race number, but it’s not surprising I couldn’t find her, as there was over 800 runners. I told you this race was becoming popular. Aeroplane arms – how happy do I look? The organiser called us out onto the road to line up for the start, so I abandoned my search and lined up somewhere near the 55 minute pacer. A man enthusiastically called the start, we shuffled forward and were off. I do confess I had forgotten the course was quite as undulating as it was. No serious inclines (apart from the last hill with 1 Km to go) but enough to keep you on your toes. We wove out of Corsham and through small lanes beyond. It is a pretty route and even when out in the countryside there were people supporting the race. Kudos to the lady in her dressing gown and slippers out on the pavement clapping everyone as they ran past. I loved the orange segments that were handed out at the 6K mark – they helped me get up that last hill and along the final straight that seems to go on for miles. I found a great photo from the start, where I was looking happy and smiling. Then I looked closely … and spotted the elusive ‘Other Lucy’ … running right next to me. Never mind “Where’s Wally”, this has been “Locate Lucy”! * I might not have found the Lucy I was looking for, but I did find another Lucy that I met at one of the Bath Skyline 10K races, along with some other ladies from the Run Mummy Run group. Another lovely lady (she’s a Lucy – say no more! ), it was only a shame she’d just sold the last of the cakes on the stall she was running at the end. The fourth in this series, the third I’ve run, and the second on the new course from Bath Racecourse. Also the first time I’ve run in shorts*, in February. 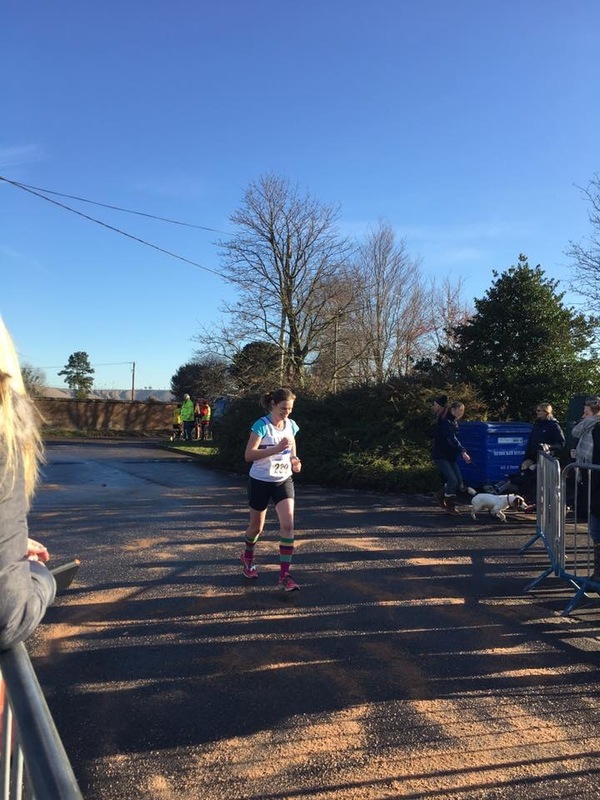 Most of this race was the same as the January running, so just read my report of it so I don’t have to write it again. Differences this time? I really wasn’t feeling it before the race. I even Tweeted about it, but moaning didn’t help (it never does). The waves seemed much smaller today – maybe only 50 people lined up with me for the start of wave 4 – so there was never any waiting or queuing at stiles or puddles. 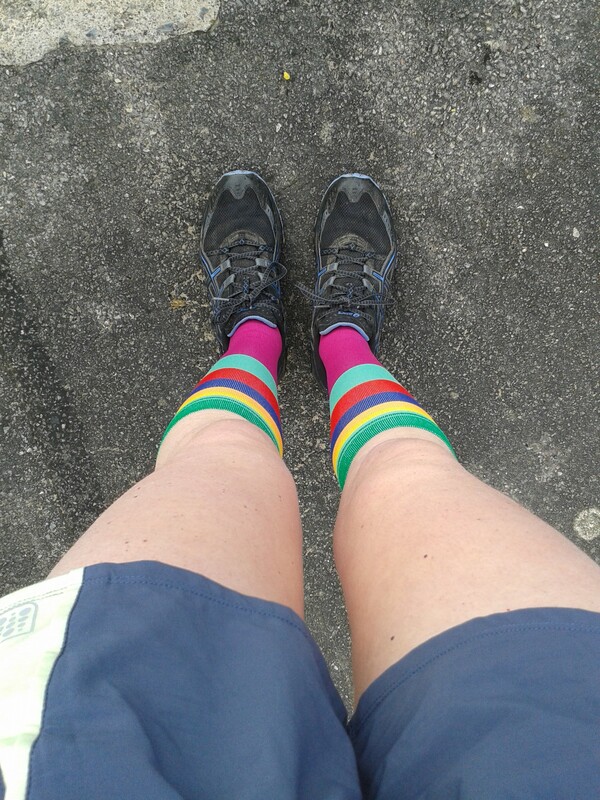 Once we set off, I cheered up somewhere between being told I was wearing the best socks, and getting said socks covered in mud. The puddles were just as deep as last month, but the overall slippiness was less which made it more enjoyable -it was possible to stagger up the hills rather than crawl up. Chatting to a man in the car park afterwards, he said in the section that climbs back up through the trees it looked just like groups of zombies staggering along. I reached the top of this section, came back out onto the footpath and told the marshall “I’m a broken woman!” so I know how they were feeling. 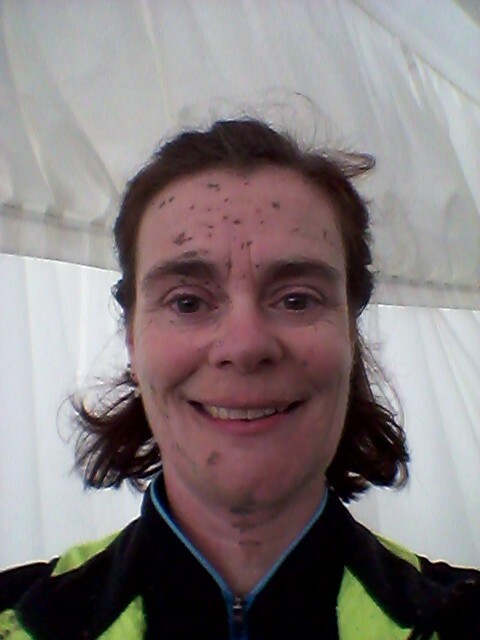 So another muddy hilly race done, and the final part of the interlocking medals collected. I wasn’t sure if I’d run a series of races like this again, they have messed up my longer runs. Then I saw Relish Running have another series that goes through old railway tunnels in (under?) 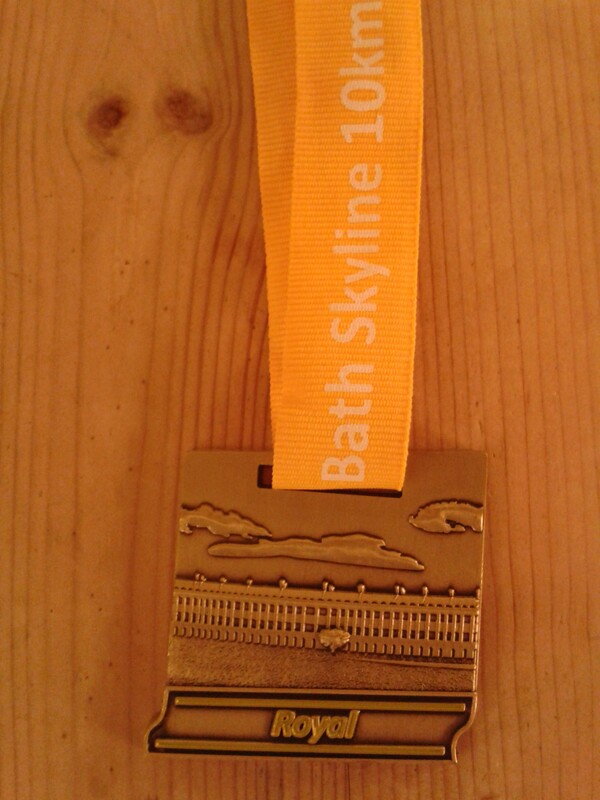 Bath that has a train on the interlocking medals …. I like trains! When I arrived home after this morning’s race, I told my family I felt like I’d been steamrollered. (Teen 2 promptly asked if I’d ever actually been steamrollered. I told him Health and Safety standards had been much lower in the seventies when I was little). How I arrived home, post steam rollering. 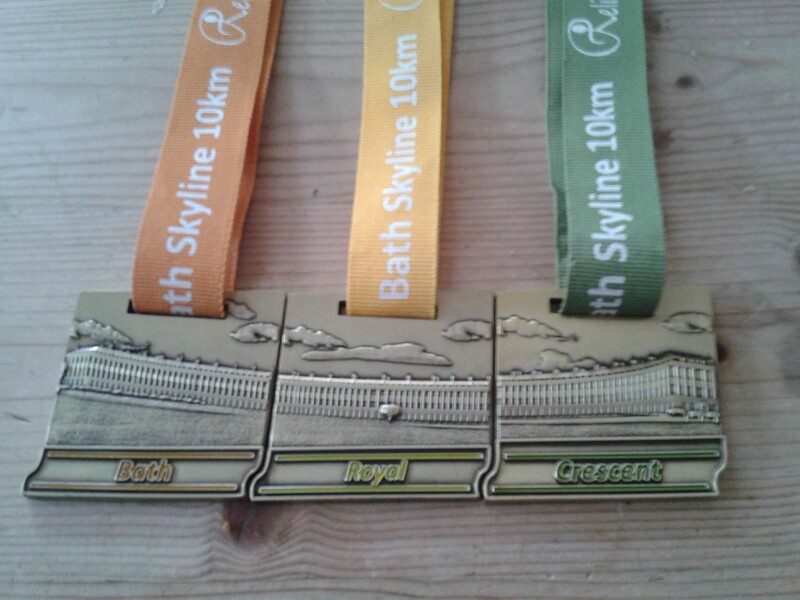 At the last Skyline 10K I ran, back in November, I was fairly scathing about the course, the organisation, the location, in fact about everything except the medal. (Read my race report here). I am very pleased to report that Relish Running Races has acted on all of these problems and turned this into a fantastic race. It has moved to Bath Racecourse, the route is all off road and incorporates two big hills, and after the recent wet weather we had been warned it would be muddy. I’ll notlie to you, the course was hard. Steep hills are always going to be difficult (for me) to navigate. Throw in thick, oozy mud and things get interesting. Wading and splashing through knee high mud is one thing. However slipping and sliding down a steep hill or being unable to climb back up the otherside because you have zero grip is quite another. Think cartoon running, where your legs are spinning but you don’t actually move. It was all good fun. I love the camaraderie at tough races like this. I love that I was complimented on my balance as I slithered out of control down a muddy slope (I told my complimentor not to jinx me). I love that I was inspired to tell a strange man that he was my favourite person so far this year (he was handing out the chocolate bars at the end). I was touched that I spotted an expression of true love in the car park afterwards, when I saw a chap struggling to pull off his partner’s muddy tights for her whilst she held onto the car seat with both hands. I did think with a name like the Pudding Run this race promised to be great. The fact that it sold out in a week back at the end of September was another good sign. I actually was given a place by a lovely man who was injured and I was able to transfer the place to myself just a few days before (how come bigger races can’t do this?!) I was even offered a lift by a friend, Julia, which was a good omen and great company. Fortunately by the time I’d finished this internal monologue I’d passed the finish line and was on my second lap. It was hard, I didn’t beat my PB, I was overtaken on the final straight by a lady in an amazing Christmas Tree hat, but it was a great race. 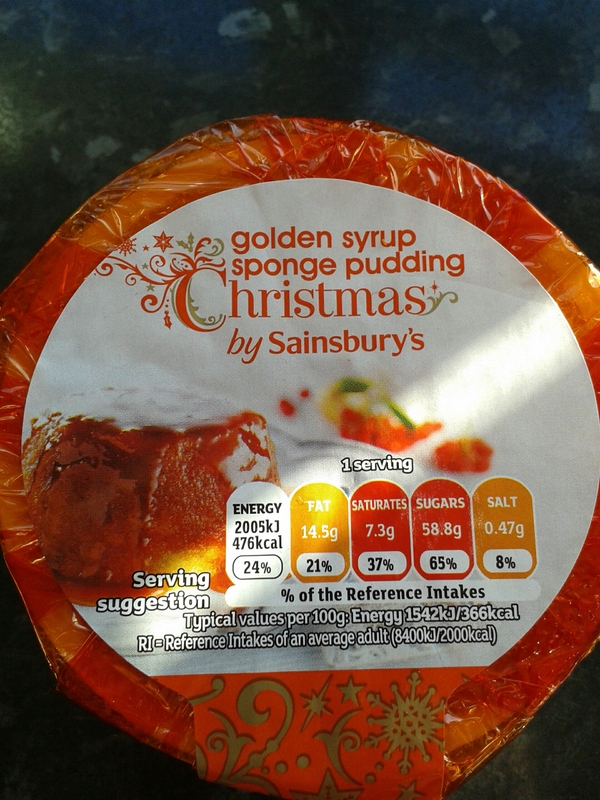 There was even a choice of puddings, so Grinches like me could have syrup sponge or chocolate pudding instead. It was great, and I will be signing up next September. Normally I would say hilly and muddy beats just about any other run hands down (unless you’re after a PB of course). So a showdown between a hilly and muddy 10K race vs. flat and fast 10k race would normally be easy to call. Add in the fact that you get a medal at the hilly and muddy race, but not at the other, and you’d assume I didn’t even have to spend a second agonizing over a decision. Simple pimple. Hang on though, put those trail trainers down – the flat and fast race isn’t an ordinary race. It’s the 10K “Pudding Race”. It sold out in a week back at the start of October, and you might not get a medal at the end but you do get a Christmas Pudding. Ah – that muddied the waters for you, didn’t it? To cut a long story short, I put my trail trainers back in the muddy bag they live in, and took my road runners out this morning for some ‘bursts’ to try and get my legs used to running fast without getting distracted and slowing down. Apart from the large tractors on little lanes which meant I had to leap into the hedge, they went well. Roll on the pudding! race!